I didn’t put much planning into this but somehow it worked out that the last few posts have been pop culture-related, starting with the Harry Potter celebration at Big Sugar Bakeshop to the Simpsons-inspired Kwik-E-Mart in Burbank. So in conjunction with the San Diego Comic-Con that will be invading my hometown this week, I’ll keep up the momentum by posting about a cookbook residing on my kitchen shelves. 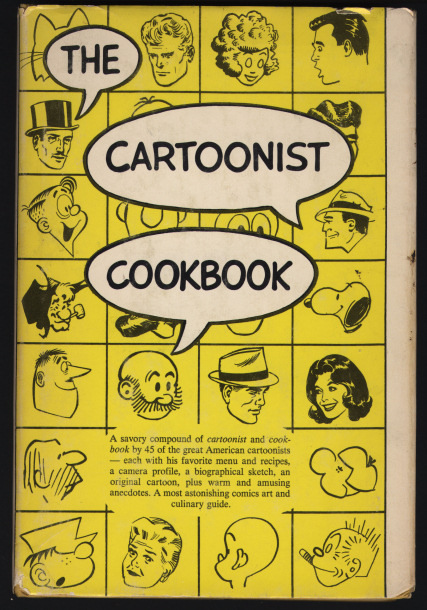 The aptly titled “Cartoonist Cookbook” features a variety of newspaper cartoonists from 1966. The obvious likes of Charles Schulz (“Peanuts”) to lesser-known Stan Drake (“The Heart of Juliet Jones”) are included. The cartoonists featured in the book offer up a mini bio, a photo and a sample of their work alongside their menu. Everyone’s recipes are at the very back. The menus are very telling about the time and place of America. Some of the menus include a cocktail of some sort and a potato and meat dish in a souffle-slash-casserole combination. Some are just downright attrocious such as Peter Hanson’s (“Lolly”) menu of garlic popcorn, stroganoff hansen and eggplant malibu. What meal is this for Mr. Hansen? Others I just wonder if it’s their actual menu or their wive’s-slash-housekeeper’s like Dr. Athelstan Spilhaus’s (“Our New Age”) menu of cold clear borsche, crab nebula, asparagus with hollandaise, belgian endive, Poully Fuisse 1951, Wisconsin swiss cheese and apple finished off with medoc or port. All I can say is wow. 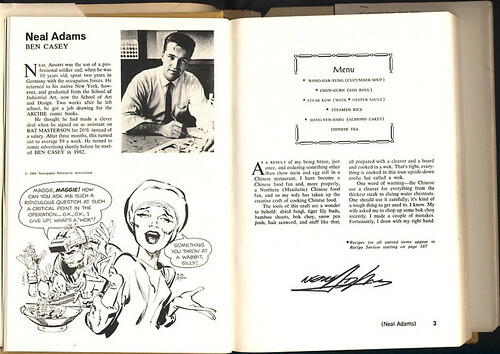 A scan from Neal Adams’ entry in “The Cartoonist Cookbook” with his signature from last year’s Comic Con. But my favorite menu is by one of my favorite artists, Neal Adams. Long before he went on to DC and Marvel working on titles like Batman and the X-Men, he did “Ben Casey.” His version of Batgirl is just downright lovely, although admittedly his work for the Flonase commercial is cringe-worthy. But that’s forgiveable because he is a handsome man (then and now) and he still has all his rockstar hair. Exotic for 1966, Neal Adams’ menu features Chinese food in what I can assume is the authentic Mandarin name. Mr. Adams can cook for me anytime. “The Cartoonist Cookbook” can occasionally be found for sale on eBay for a steal and it deserves a place on the shelf for any fan of comics and cooking. What an excellent book to collect. On eBay now looking for a copy. Oooooooooh, 1966, my birth year (gawd i'm old! )… this is super cool. 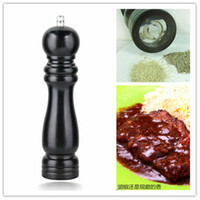 What a great thing to have! i'd love to see a copy of this. i haven't heard "Lolly" mentioned in i don't know HOW long. Eggplant Malibu?! Ha. Sounds interesting!i love pop culture… it's something that connects generations to one another.Neal Adams… worth looking into. Didn't know about Flonase. Is that a TV commercial only? i don't watch TV so i haven't seen it… gotta check out hsi work.Very interesting post, i love it. And what perfect timing. The Comic-Con is gonna be crazy huge this year. i can't believe how much bigger and better it gets every year. Hi Luis–Yes, get your copy on eBay. The last time I looked, they were going for under $5. Good luck!Hi Kleopatra–To be honest, I'm not familiar with "Lolly." But glad it brought you back in time for a little while.I looked up eggplant malibu in the back and it's thinly sliced eggplant fried in a little olive oil then baked with tomato sauce, garlic and a little cheese in the oven. That dish just speaks Malibu doesn't it? ?Flonase is indeed a television commercial only. There are two variations of it but the first one was done by Adams and featured a French speaking bee allergic to flowers.Thanks for visiting. Maybe I'll see you at the convention this year! Interesting post about an old cookbook. Didn't know that such a thing existed especially since I'm a Adams fan. Hi Anonymous–Thanks! If you're an Adams fan, I'm sure this would be a fun item to look at and add to your collection.Hi Photogirl–I want to try out some recipes from the cookbook. I'll see you soon!